A superhydrophobic cotton textile with high antibacterial properties has been fabricated. 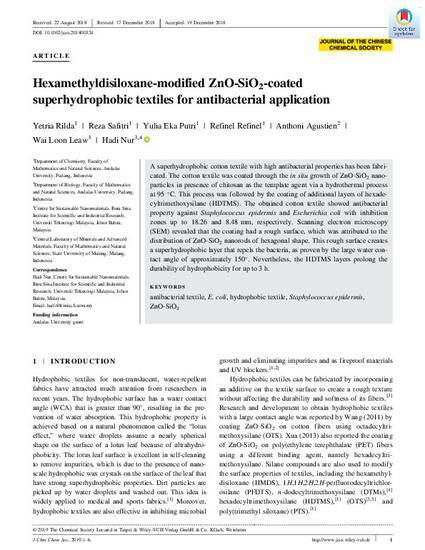 The cotton textile was coated through the in situ growth of ZnO-SiO2 nanoparticles in presence of chitosan as the template agent via a hydrothermal process at 95 C. This process was followed by the coating of additional layers of hexadecyltrimethoxysilane (HDTMS). The obtained cotton textile showed antibacterial property against Staphylococcus epidermis and Escherichia coli with inhibition zones up to 18.26 and 8.48 mm, respectively. Scanning electron microscopy (SEM) revealed that the coating had a rough surface, which was attributed to the distribution of ZnO-SiO2 nanorods of hexagonal shape. This rough surface creates a superhydrophobic layer that repels the bacteria, as proven by the large water contact angle of approximately 150. Nevertheless, the HDTMS layers prolong the durability of hydrophobicity for up to 3 h.